VaultPress backs up your site as your site changes. Create a new post, receive a new comment, update a page — any change to your WordPress data is tracked and backed up immediately. This means VaultPress always has an update-to-date backup of your site. This also means that your site’s list of backups may have been hard to navigate. No longer! We’ve added a list of calendars to your VaultPress dashboard. You can click around from day-to-day and see all of the backups for your site, restoring (or downloading) any one as needed. Each day is color coded to help identify days with lots of activity, ranging from white (one or two backups), to yellow, to orange, and red (lots of changes on those days mean more backups). 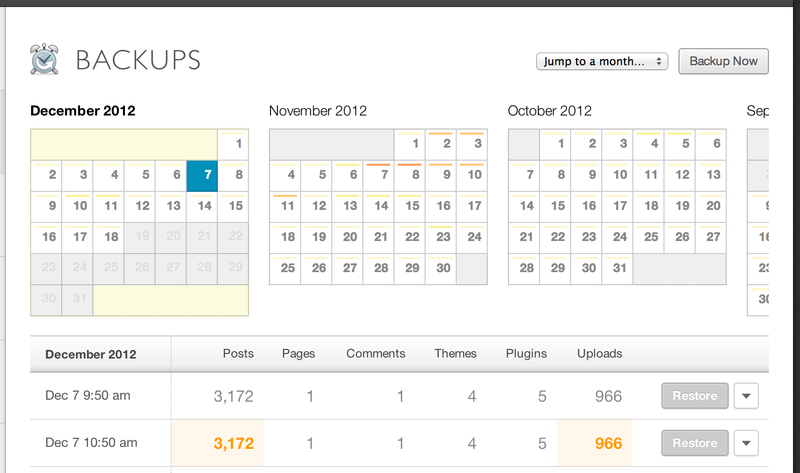 VaultPress customers can see the new calendars by signing in to their VaultPress dashboard. We hope this makes it easier to find the backup you need, when you need it. This entry was posted in Announcements, Design and tagged backups, calendars, design. Bookmark the permalink.